NBA analytics movement, also known as NBA Moneyball, is a data-driven approach that uses statistical analysis of big data. The old school method, measuring talent by watching, a.k.a. the “eye-test” didn’t die. But now it has an unlikely ally despite the fact that Charles Barkley thinks analytics is crap. – Where Does the Moneyball Term Come From? – How Do NBA Teams Utilize Analytics? – What Data Types Have Been Used? Where Does the Moneyball Term Come From? Oakland Athletics general manager Billy Beane built successful baseball teams year after year, rather than relying on the gut instincts of old-time scouts, as was standard practice for decades. Writer Micheal Lewis realized another investment game was being played out in baseball, notably by the A's. He gained inside access to A's general manager Billy Beane and got a look at how Beane's value players differently than other teams. Oakland A’s was a low-budget MLB franchise, they attempted to employ an analytics-savvy approach to maintain a high level of success despite limited financial conditions. In 2003, Lewis wrote a book called Moneyball: The Art of Winning an Unfair Game. Oakland evaluated offensive efficiency differently than others, stressing on-base percentage and power, de-emphasizing stolen bases and putting the ball in play. It has engendered an approach to acquiring talent based as much on statistical achievement as on traditional tools, an approach that has gripped some franchises and galled many traditionalists. 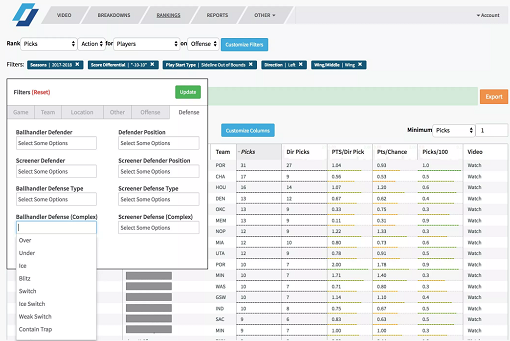 How Do NBA Teams Utilize Analytics? For the time being, the every NBA team has embraced analytics, as they employ analytics staff who directly work with or reports to technical staff as well as front office executives. What Data Types Have Been Used? Chart courtesy of the great Backpicks. Before the video-tracking era, analytics departments of teams were crunching numbers with tools such as StatsCube, Synergy. 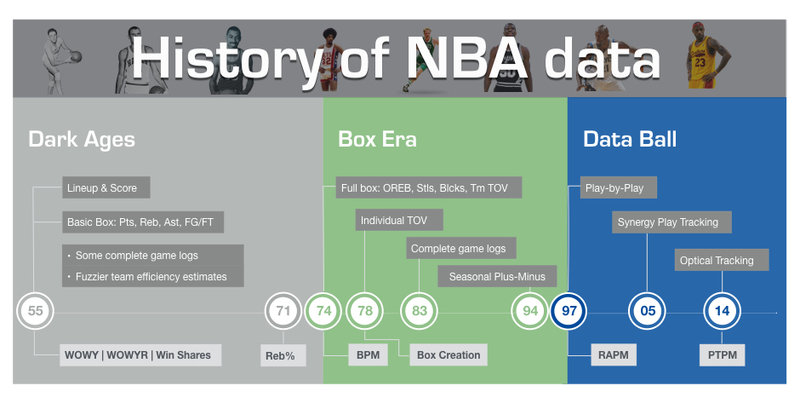 Video tracking has been considered to be a milestone for the NBA analytics movement. Dean Oliver is to the NBA what Bill James is to baseball. In 2004, he wrote “Basketball on Paper”, there were only a handful of stat-heads in NBA front offices and fans didn’t have much interest to numbers. He introduced possession-based stats and four factors with the basketball community. In the following years, many NBA stats resources and countless blogs including NBAstuffer came in and became popular sources for statistical hoops analysis. Those websites focused on plus-minus metrics, shot efficiency and spatial analysis with the help of play-by-play data. In 2008, STATS has acquired SportVu, a video tracking tool which was originally developed for soccer. Basically, SportVu adds the third dimension to the traditional stats. Positioning data for all 10 players, 3 referees and the ball can be captured with 25 pictures per second. In the 2010-11 season, Dallas Mavericks, Houston Rockets, Oklahoma City Thunder and San Antonio Spurs jumped in this technology and installed cameras. The next season, Celtics and Golden State Warriors were added. Starting from the 2013-14 season, NBA made SportVu cameras installed in every arena. With this move, the NBA became the first American sports league to use player tracking in every game. As a result, the amount of data is exploded. Instead of stat-geeks, computer engineers and data scientists with machine learning skills have started to be targeted by NBA teams. Starting from 2017-2018 season, the NBA switched from STATS & SportVU to Sportradar & Second Spectrum alliance. Screen shot courtesy of Nylon Calculus. In 2004-05 season, the Suns led the league in possessions per game (averaged 98.6 pace) with Mike D’Antoni being head coach. The Suns were the clear flagship carrier of the up-tempo revolution. Fans loved the speed and a following transition 3-pointer so much that this became an NBA normal then where average pace was measured at 99.6 in 2017-18. Pelicans led the league with a 100.5 pace coached by Alvin Gentry who was also an assistant coach for Suns in 2004-05. One can easily suggest that the three-point shots have altered the NBA fundamentally. It is being considered as a revolutionary, desirable strategy for any team in the last 10 years. Since the introduction in 1979, the efficiency of three-point shots was massively ignored. But, today each team has embraced 3P shooting so well that the average of three-points taken has risen to 27 in 2017. Chart courtesy of Omni-Sci blog with the shot data provided by BigDataBall. Thanks to playing “Moreyball“, the Rockets leads the league in 3PT attempts per game at 42.6, which makes more than a half of their total points scored. 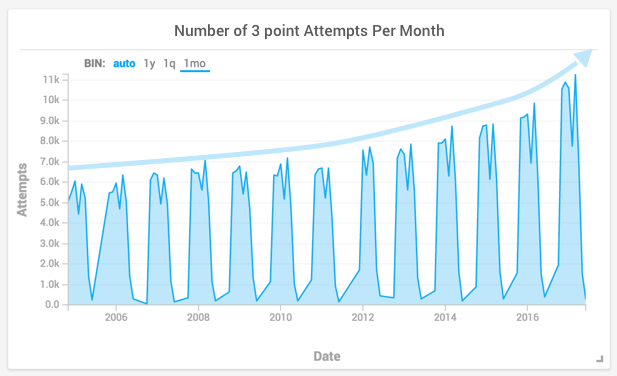 The value of three-point shooting is so high that more players have started to shoot threes. For example, Mehmet Okur, a center who was good at shooting threes, attempted roughly four 3P shots per game in the 2000’s. At his time, this was a huge thing. Now, there are a dozen of bigs who like to shot three. We try to keep this content up-to-date. Consider using the social media buttons below, or add the page URL when sharing it anywhere.